Cast: Gregg Sulkin, Helena Bonham Carter, Eddie Marsan, Peter Serafinowicz, Catherine Tate, Stephen Rae. Story: A boy's bar mitzvah falls on the day of the 1966 World Cup Final. Sixty Six is a pleasant enough movie, but I can't help feeling it's more suited to a living room viewing rather than a trip to the cinema. It's 1966, little Bernie is about to graduate into manhood, and the highlight of his life, his bar mitzvah, is due on 30th July. Hmmm, why does that date sound familiar? Well, OK, it doesn't, I'm bluffing. But if you're a footie fan you'll know that was England's finest hour, the day of their one and only World Cup triumph. 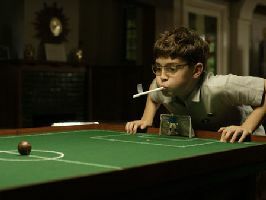 Sixty Six follows little Bernie and his dysfunctional family as they struggle in vain to put on a party for him to rival arguably the greatest sporting event in this country's history. Helena Bonham Carter and Eddie Marsan (you'll recognise him when you see him - he's been in everything from Miami Vice to Vera Drake) deliver quality performances as his parents, while comedy actor Peter Serafinowicz (Shaun of the Dead and numerous TV comedy panel appearances) is in fine form as the wisecracking uncle who even gets a couple of genuinely funny jokes to tell. The currently ubiquitous "am I bovvered" Catherine Tate joins the comedic cast and plays it nearly straight, but it's the star Gregg Sulkin who needs to be good - and fortunately he convinces as the downtrodden and delusioned Bernie. There really isn't much in the way of plot in Sixty Six. More and more people drop out of the party as England get closer to the final, more and more calamities hit the family, further threatening the success of the bar mitzvah. Quite why they couldn't have had the bar mitzvah on another day is not fully explored - but according to the credits it's a "true-ish" story so I guess that was out of the question. After the rather ordinary trudge through the meat of the story, the ending comes alive a little, which really helps with your overall impression when leaving the theatre. Throughout, the period atmosphere is superb, particularly during the final scene itself - you'll understand when you see it but I shan't destroy the surprise. There's nothing really to criticise, it's just that the whole effect is less of a movie and more of a couple of episodes of Where The Heart Is - and you wouldn't pay six quid for that, now would you? Sixty Six is a warm and likeable affair. I can't pick any particular holes in it, but still I feel that my money might have been better spent if I'd gone next door into Borat. Ordinary but nice. To enjoy this film you should be: at home with a hot toddy. Sixty Six was released in the UK on 3rd November.